Other Physical Attributes: T'Lara wears her hair long, past the shoulders, but kept in a regulation manner. The front of her hair is kept out of her eyes, and her ears are normally either uncovered, or sparsely covered, to facilitate better hearing. T'Lara was born in Shi'Kahr on Vulcan in the Earth year 2097 to Soresk and T'Kel. Both her parents were noted as being well recognized scientists, each with several degrees. Soresk and T'Kel were both on the Vulcan Science Directorate, and had each taught for a period of time at the Vulcan Science Academy. The sciences and the furthering of Vulcans' knowledge of the universe were long standing traditions in T'Lara's family. From an early age, T'Lara followed in her parents' footsteps. She excelled in her education at the Vulcan Science Academy, and fulfilled several low tier roles in duty for the Vulcan High Command in the field of sciences. 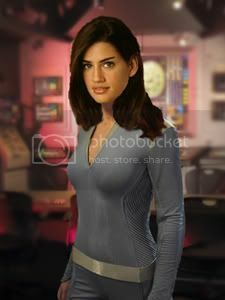 During her tenure at the Vulcan High Command, she was approached by the Vulcan Science Academy, offering a teaching position. She was quite young, by most standards, to be approached for such a thing, but it was a credit to her knowledge that the Academy desired her to apply her ability towards teaching the younger students in a variety of sciences. During the time in which she was considering the offer made by the Academy, she had been asked to serve the High Command in more esoteric fields. She received training enough to facilitate those assignments, which were admittedly brief, but it expanded her skill base considerably. It was while she worked for the Vulcan High Command as a low tier scientist and consultant that she became aware that the species her people had made contact with nearly a century before, the humans, were preparing to embark on missions to the stars. She'd always found the curious people of Earth fascinating, and she desired the chance to study them in more detail. Meanwhile, the Vulcan Science Academy apprised her that she had had more than ample time to reach a decision concerning their offer of a teaching position. Also, to further complicate matters, in recent years, the family of her intended bondmate, who the bonding had been arranged by her parents and his some forty plus years earlier had contacted her, telling her the time for bonding had come. If she bonded, it would preclude her from being able to pursue her intent to venture into deep space, and possibly get a chance to study the humans up close. In a very rebellious, for a Vulcan, manner, T'Lara politely informed her intended's parents, and her own, that she would not be bonding. Her career was in too pivotal a position at that moment to allow anything to derail it from its intended course. If she were to bond, it would be after she had solidified her career so that her life would have meaning. This, of course, caused quite an outrage (if Vulcans can be said to be outraged), but her mind was made up. There would be no changing it. Though she regretted the disappointment her family felt, she informed the Vulcan High Command of her intentions, and took the next available ship to Earth.